Last week, we lost an incredible individual who impacted the lives of countless individuals across the globe. 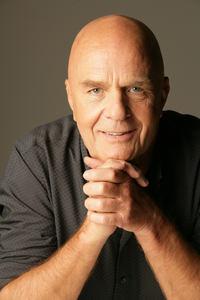 This week’s Simple Quote Sunday will be in memory of Wayne Dyer, and although it is more of a story than a quote, there is still an extremely valuable lesson that we can all learn something from. ‘If I were to squeeze this orange as hard as I could, what would come out?’ I asked him. This past week was a very difficult one because the world lost an incredible human being on Sunday, March 8th. Whenever the medical mission team I volunteer with would go to Guatemala and stay at the orphanage Mami Leo founded nearly thirty years ago, she would remind us to not forget about the children upon our return to the states. Our group stayed at the home for only one week, twice a year, and that’s it. For the other 355 days in the year, Leonor Portela, who was more affectionately known as Mami Leo was at the home with the children by herself. Through the hurricanes, earthquakes, mudslides, and the days with no electricity, Mami Leo was there protecting her children. It takes a special person to dedicate her life just to provide a life for others, and that’s exactly what Mami Leo did. I flew out to Guatemala City early Wednesday morning and arrived just in time for a beautiful mass held in her honor. The entire church was packed and there was not an empty seat in the building. Looking around the room and seeing just how many people Mami Leo has impacted throughout her life was an incredible sight, and knowing that this wasn’t even close to the amount of people she saved and inspired was even more incredible. The funeral procession commenced once the mass concluded, and it was just as difficult as you can imagine. When the funeral concluded, we drove to the orphanage in Sumpango, Sacatepequez where we all gathered around and talked, sharing stories of Mami Leo with one another. We lined a bunch of tables next to one another and sat down for dinner in a long rectangular set-up. I sat by the center table, and as I looked to my left and right, a sense of peace overcame me. It was truly a beautiful sight; the table was filled with children of all ages who had been saved by Mami Leo (some of whom are pictured below). Even young adults who no longer live in the home came back to spend time with Memo Leo before her passing, and celebrate her life following this terrible loss. In looking around and taking in the surrounding environment, I realized the true impact of Mami Leo’s life work. Some of the people sitting at the table were among the first few children Mami Leo took in years ago, and they were sitting here with children of their own whom you can tell are provided with unconditional love and support. The love that Mami Leo gave to her children has been carried on to their own children, and Mami Leo has successfully helped them break the chain of abuse, neglect, and abandonment in Guatemala. They are well-integrated members of society, many in Guatemala, and some in the United States. And what is just as special is the fact that they all still treasure where they come from, the beautiful home Mami Leo took them into, Misioneros Del Camino. So while we mourn a tragic loss of what I truly believe is a one of a kind saint, we also rejoice in knowing that Mami Leo’s legacy isn’t going anywhere. We can all come together to help fulfill her mission and dream of providing love and support to such children in need, and more importantly, we will never forget Mami Leo, her work, or the thousands of children whom she is survived by. And as she once said, plain and simply, “If you don’t dream, you’ll never make it.” Descansa en paz Mami Leo.